That's an old picture but it shows you that I've had a great day! My day started out with Mom packing my lunch box! You know what that means right? Day Care! They were so happy to see me. They said I was a perfect gentleman for my nail trim. I guess I was. I also got some great massages and cuddles instead of playtime. Who wants playtime when you can get cuddles? Dad came to get me and we walked home. Everyone had supper and then Dad took Puppy and I for a walk! Oh my DOG! I'm exhausti-pei-ted! But I had to write, just to let you know how I was doing. Oh! Before I forget, my Uncle Marty needs some Power of the Paw. He was going to go flying this weekend (he's a recreational pilot) but he managed to somehow perforate his ear drum. If you could send vibes to my uncle to get better, I'd appreciate it. Thanks! First off I would like to thank all my friends who sent Paw Power to Dannan The Little Brown Dog . He's home and starting to feel better. I would have thanked everyone yesterday but I had a double helping of grandparents to snoopervise. Grandma and Grandad were here for their regularly scheduled Puppy and Bolo cuddling event. I enjoy these - except when they leave for a walk without me. Then I get upset. They haven't done that for a while. Which may be because it happens to rain just as they are deciding what we should all do for the afternoon. Then Mom and Dad came home and I was very clingy Mom says. Well, you know, it's been an exciting week and sometimes I think Mom spends too much time with Puppy. Anyway, Mom and Dad weren't home all that long before Granny and Bionic Grandpa showed up! I tell you I didn't know where I should be sniffing so I hid under the table where Mom could scratch my ears. When in doubt, an ear scratch is the way to go. Today Grandma and Grandad were back! It was like their third day in a row of being here! I think they miss me when they go home. Honestly I do. But because they were here, I got my own private walk with Mom! Oh my DOG! It's been so long since I had one of those. Thank you Grandma and Grandad for letting me have a private walk with Mom! I miss those. Anyway, I'm exhaustipeited after entertaining and snoopervising grandparents for the last three days, so I'm off for a nap. I'm hoping Mom and/or Dad think I need cuddling and come and join me. So there I was this afternoon, not so calmly telling Mom that I wanted both cuddles and to go outside in the backyard when she FINALLY opened the door. 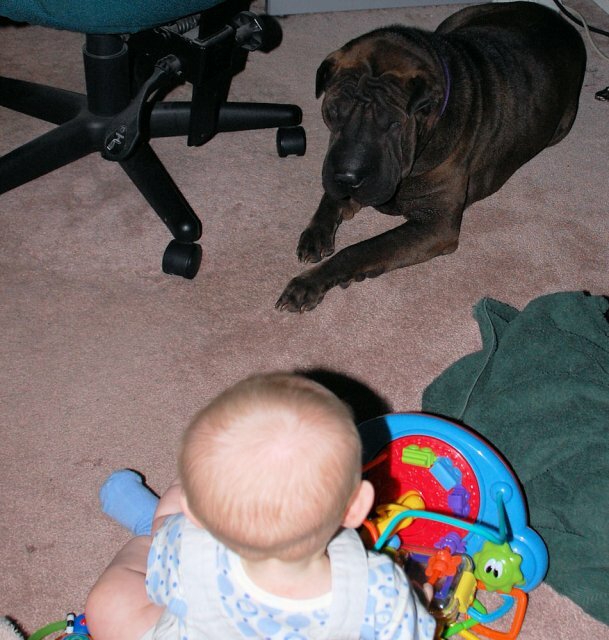 I mean, I know Grandma and Grandad were only there to see me - and maybe Puppy - but when a Pei has to go, he HAS to go. Then there was the WHAT THE HECK moment. The house started to rumble. Thank DOG I was outside. Puppy would like you all to think that it was him jumping in his jumping thing that caused the earthquake that hit our area this afternoon, but the truth is, he wasn't even in it. Maybe it's from all his historical jumping though. Apparently they felt it as far south as Vermont and Cleveland - where's that......Ohio right? Anyway, we're safe and sound here. As you know, my family and I went Time Travelling on Saturday to a Medieval Fair. We saw LOTS of Not-Dogs. Mom really liked this one and wanted to bring it home. Meh, it wasn't as entertaining as some of the other things we saw. I didn't get too close because they didn't speak Shar Pei. FlatPappy didn't get close either, but he at least got a pictures taken with them. I'm not sure WHAT he is. Any ideas? So, like I said yesterday, we went TIME TRAVELLING! Dad is so lucky he can dress the part isn't he? He made that armour, isn't it pretty? I snoopervised of course, because that's what Shar Peis do! 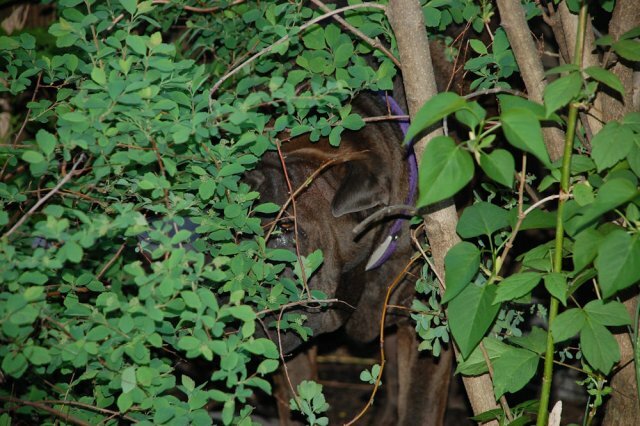 There was SO much to sniff there, as you can well imagine. Oh FlatPappy! What did you find? That looks pretty cool. What is it? A ballista! Way cool! No, Mom says we can't bring it home, there isn't enough room in the trunk. Not with Puppy's Caddilac anyway, that think takes up a TON of room. We also had fun storming the castle. I'm so glad Daddy is on our team. FINALLY! Sunday went by WAY too slowly. I've been SO excited to tell you all about my most AMAZING Noseventure on Saturday. So, as I said, Mom pack up my lunch, then called the Petshotel to say I would not be going in. THis confused me greatly. Packing my lunchbox usually means a trip to Day Care. This time Mom and Dad packed us all up into the car and off we went! We went TIME TRAVELLING! Is that cool or what! That's Dad and I in front of a house from the 1860's or so. It was just a stopover before our finally destination. Time travel is a very delicate thing you know. We can't break the time/space continum or we'll all disappear. Or something like that anyway. We didn't stop in the 19th Century for too long, but I did try and make friends with some of the locals. I thought they were Shar Peis actually, but then they got a little closer and I discovered they weren't! I REALLY wanted to bring one home, but they weren't interested. Flat Pappy (who came with us) also wanted one. Even a flat version would have been nice he said, but they weren't interested. Finally we arrived at out nifty neat o destination! Time Travelling is SO much fun. I'll post more tomorrow! We went on a MASSIVE family Adventure yesterday. Mom is downloading pictures and uploading them to Uncle Marty's website so we can post about it on Monday. It all started with rain - blech. Then Mom packed my lunch box - this normally means ADVENTURE. Then she called the Petshotel and said I wasn't going to be visiting. WAH? But the Lunch Box is packed!?!?!? Then they put my harness on. I was a lot confused at that point, but I jumped into the car anyway - I mean, you have to trust your parents don't you? There was MASSIVE Noseventures happening. OH MY DOG! I even found a place to roach - and I'm NOT a roacher. I was cuddled and photographed and sniffed EVERYTHING! There were lots of other doggies and a bunch of not-doggies and the a visit to Grandma and Grandad's and when I came home THEY gave me a bath. Phew! Doesn't that sound FANTASTIC?!?!? You can't wait for pictures right?!?!? Come back tomorrow when we'll have pictures and more descriptions. Mom and Puppy went out today. I was NOT invited. Hmph. They came back smelling like my cousins...and something else. Mom had gone out with her camera so I pawed through it. Looks like I have a new cousin. It's a giant cotton ball with eyes. Mom says her name is Mayhem. I kept going through the camera to make sure there was at least 1 picture of me. There was. PHEW! I was feeling a little left out there for a moment. I have discovered the reason for wrinkles. As many of you know - or maybe you don't - Shar Peis, as a breed, are not fond of water. With the exception of Hero Shar Pei who knows how to swim and makes us all shiver in fear everytime we see him in water. Water is not our friend. I have discovered the REASON. We are made out of sugar. That's what Mom said when she took me out to the car this morning to drive Dad to work. Shar Peis are made out of sugar. That would explain SO many things. For one thing, we have wrinkles. That's melted sugar from all the times we've gotten wet! I am a genius don't you think? Now to be a super awesome genius, I have to figure out how to communicate this to Mom before I get washed away completely! All is forgiven. Oh good. I made sure to spend a lot of time cuddling Mom so she'd know there were no hard feelings about Monday. Then there were Bolo Cuddle Sandwiches, which are never bad, even if Puppy was there too. After I finish writing this, I'm going to settle on Mom's feet under her desk and tell her I love her. Other than a few walkies with Dad ... and Puppy...sigh... nothing much has happened here. Here's an older picture, but still a good one. I'd like to start off my post for today by saying IT'S NOT MY FAULT! Mom even has pictures to prove it! There I was settling down for a nice nap in a sunbeam when SOMEONE - who shall remain nameless, but you can see my evidence below - started pulling my tail! Now I don't know about anyone else, but I don't like having my tail pulled! So I growled and Mom went all NO! How come -I- in my innocence at not wanting my tail pulled get into trouble? It's NOT FAIR! So I spent the rest of the day in a sulk. Mom kept the two of us apart, but HE hogged her ALL DAY and I barely got any huggles or cuddles or ear scratches. If it wasn't my fault, why did I get punished by not getting cuddles and huggles and ear scratches? Can someone tell me? 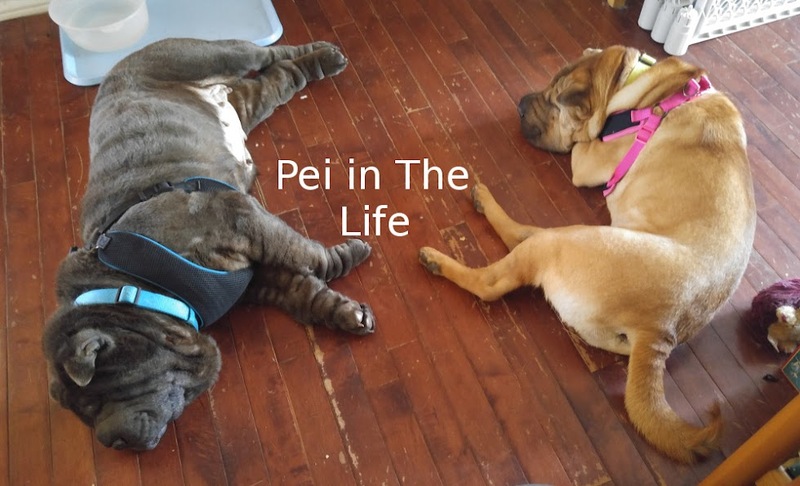 Pei-Ess From Mom - The NO was for Puppy, and Bolo didn't sulk all day, he had to patrol the yard, grab a nap and he did get some huggles, cuddles and ear scratches - just not enough to suit him.